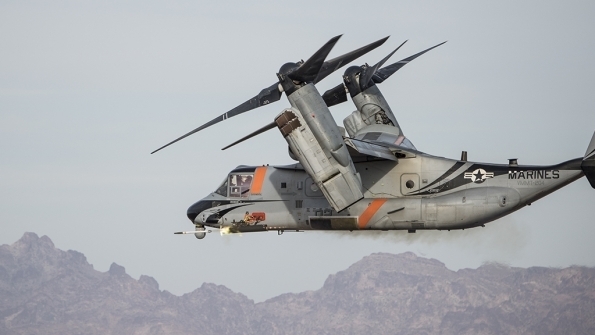 After turning the Lockheed Martin KC-130 Hercules into an armed reconnaissance platform, now the U.S. Marine Corps wants to do the same with its fleet of V-22 Osprey tiltrotors. With the Corps’ new mantra of putting a sensor and weapon on every one of its aerial platforms in order to achieve digital interoperability, the tiltrotor’s manufacturers, Bell and Boeing, have been carrying out self-funded trials in a bid to add a lethal arrow in the Osprey’s quiver in the form of forward-firing weapons. The trials, which took place at the Yuma Proving Grounds in Arizona last month, follow on from work to prove the aircraft’s ability to provide inflight refueling to fighter jets and to act as an electronic-warfare platform and communications node. 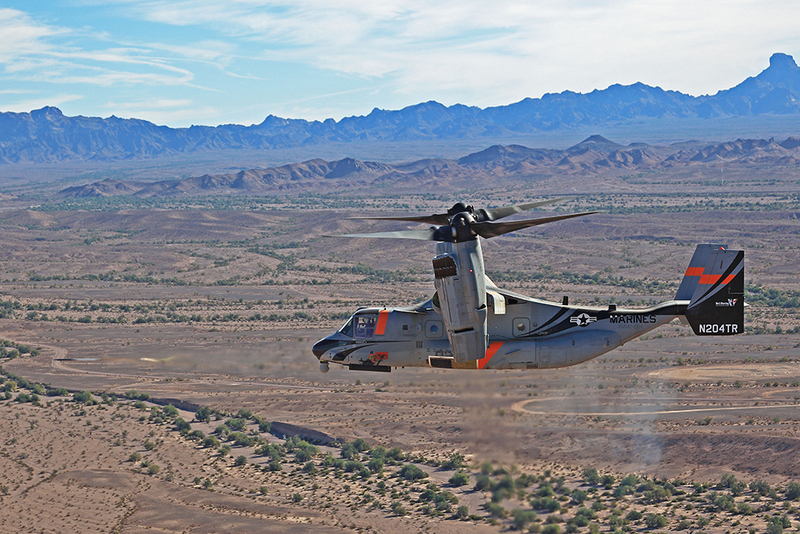 It is a long way from the V-22’s initially envisaged role of replacing the Sikorsky CH-46 Sea Knight as a high-speed troop lifter. Forward weapons capabilities tested by the Marines would give the aircraft a truly offensive capability, supporting troops on the ground and freeing up fighter aircraft—such as the AV-8 Harrier or its replacement, the Lockheed Martin F-35B Lightning II—for other missions. 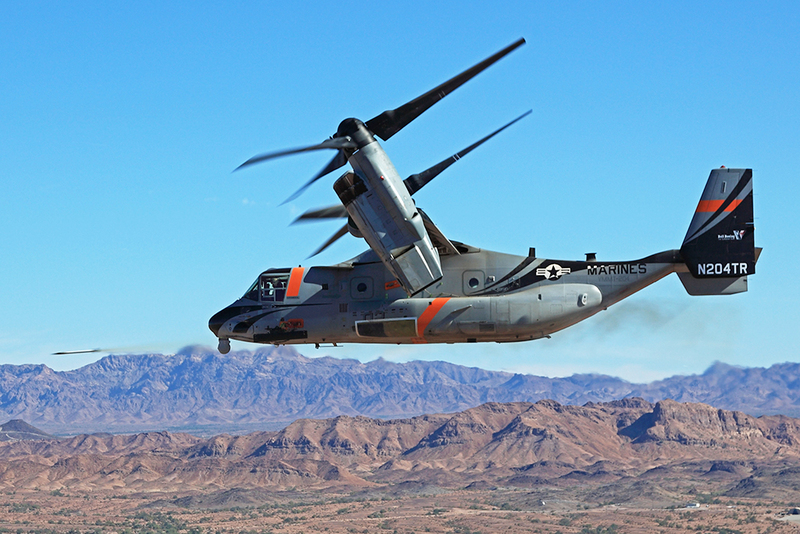 Bell used its Advanced Tactical Tilt Rotor test aircraft for the trials, allowing the company to make rapid modifications without requiring clearance from Naval Air Systems Command. During the tests, the Osprey fired 26 2.75-in. unguided rockets over five flights and then two guided rockets in the form of the BAE Systems Advanced Precision Kill Weapon System—already in use with the Marines—and a pair of Raytheon Griffin B lightweight precision guided missiles, with the Osprey firing the weapons in the hover mode and at 110 kt. with the engine nacelles at a 60-deg. angle of attack. The aircraft was modified with a small pylon arm fitted to the aircraft structure on the front port-side fuselage, underneath the aircraft commander’s cockpit window. Engineers found the structure could easily support a seven-round rocket pod, or weapons of a similar weight. Under the nose, the standard Raytheon AN/AAQ-27A electro-optical (EO) camera was replaced with L-3 Wescam MX-15 sensor fitted with a laser designator, and switching was installed in the cockpit, allowing the crew to self-designate targets.